Acquiring hundreds of different Raman or AFM images of a large sample without any ongoing process control by an operator is now reality: The alpha500 is the first instrument on the market to combine Confocal Raman Imaging and Atomic Force Microscopy in a fully automated and integrated system incorporating a motorized sample stage (150 x 100 mm) and a piezo-driven scan stage (100 x 100 x 20 �m). It not only allows high resolution surface topography imaging with AFM on many different sample positions but also Raman Imaging, large area Raman scans and multi-point spectra acquisition on a user-defined arbitrary number of measurement points. The AFM and Raman data of the same sample positions can then be matched and linked together for a more comprehensive understanding of the sample's properties. 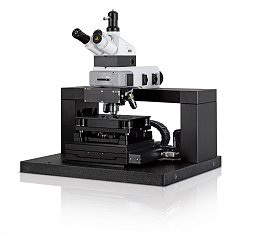 Various automated functions such as a highly accurate auto-focus for the optical mode, the precise automatic AFM-tip approach, and other specialized software features provide the versatility and accuracy necessary for the systematic and routine execution of extensive and complex measurement sequences.